Pink Heart String: Bananas are Yummy- But What Else? Bananas are Yummy- But What Else? Bella also loves bananas. Every time she sees those yellow fruits on a tray, she would say, "Mommy, I want to eat banana." And when she has eaten one banana, she would ask for another one saying, "Want another banana." We are glad that Bella likes eating bananas and other fruits too. Good thing there are lots of bananas in our country. The Philippines is the third largest producer of bananas. This is because of the tropical climate in our area which is perfect for growing bananas. Banana is a common snack or merienda in our country. As a matter of fact, I consider this as one of my favorite snacks. But if you think this is the usual yellow bananas that are merely peeled before eaten, you are wrong. I'll be showing you one banana recipe that I love to cook and of course EAT! But before that, allow me to show you the different varieties of bananas that grow in my country. 2. Latundan bananas. These bananas are round-tipped with thin yellow skin that splits once fully ripe. This is most commonly available in the market. 3. Lacatan bananas. These bananas come in different sizes. They can be long and slender and some are long and chubby. You can just let them ripe on your kitchen and you'll get a yummy aroma once its ripe. 4. Cavendish bananas. These are also called "dessert" or Chiquita bananas and are usually for export especially that they have long storage life. 5. Cardaba or Saba bananas. These bananas have a robust shape and are larger. It has a starchy flavor perfect for cooking. This is used to make banana chips, banana cue and other delicious recipes. 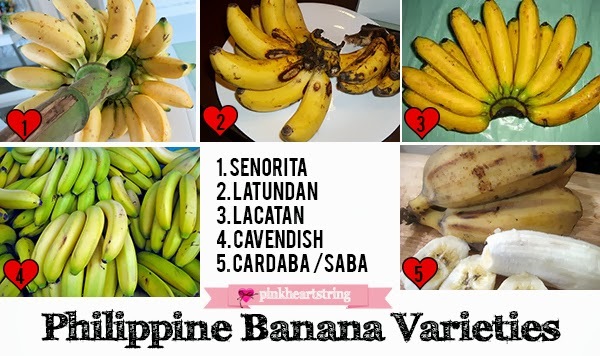 It is said that the Philippines has so many banana varieties which means that there are still a lot of them missing in my list. These are the only ones I know about. My mom said that there are also bananas that have so many seeds in it. They used to play with the seeds like a gun by blowing the seeds from their mouths towards their playmates when they were still kids. It sounds funny to me especially that I haven't encountered bananas with seeds. Of course they are! That is why it is recommended to eat them. Even babies can eat them already especially that they are soft. There are also baby foods that are banana flavored. Bananas are a good source of potassium, dietary fiber, manganese and vitamins B6 & C. Primarily, they are really a good source of potassium. 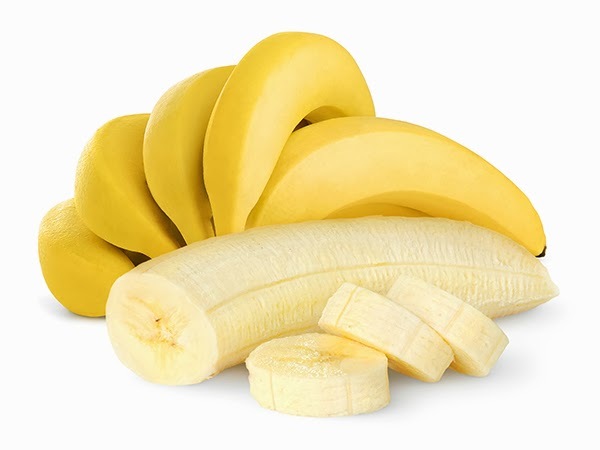 A 100 g banana could provide 358 mg potassium. This is an important component of cell and body fluids that helps control heart rate and blood pressure. Eating 100 g of bananas could provide 90 calories. It has fibers in it which helps in digestion and lessens constipation problems. It can also be a moderate source of vitamin-C which helps protect us from infectious agents. Eating fresh bananas could also give adequate levels of minerals like copper, magnesium, and manganese. 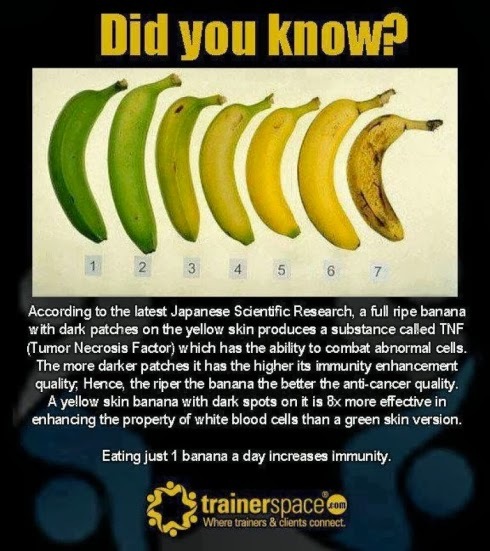 Well, who would doubt the health benefits of a banana? I guess no one would! As promised, I am going to share to you one of my favorite banana recipes. We are going to use a Saba banana for this recipe. Saba can be cooked in so many ways and would always be delicious! Sometimes, we just cook them in water and then eat them once cooked. You can also grill them which we locally call "Dangdang Q" haha. I dunno why we call it that way. It can also be a perfect addition to a Halo-halo (Mix-mix) which is a refreshing snack with different ingredients in it mixed together. Oh well, I couldn't talk about the different Saba recipes on one post. I can share to you other recipes next time. 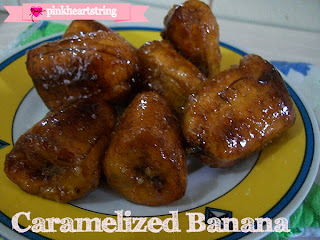 For now, here is how you can make a Banana Cue or Banana Q or a Caramelized Banana. Whatever you call it, it is still delicious! 1. Peel and cut the bananas in halves crosswise. 2. Heat oil on pan. 3. Place bananas on pan then let it cook for a while. 5. Wait until golden brown and your done. It is that simple but is very very delicious! Well, I might be a bit biased because this is a personal fave but I think if you try making one, you'll love it too. This taste a lot better when wrapped with Spring-roll/ Lumpia wrappers. Nom nom nom. If the first video was a fun banana song, the second one is a funny song.lols. These Minions are really cute! I can't help but laugh. Well, that could be one thing a banana could give us all: HAPPINESS. Mmm, that recipe looks awesome! I honestly had no idea there were so many varieties of bananas. We all love bananas in this house. Often, I eat one with a scoop of chocolate peanut butter for breakfast! We almost always have them in the house for snacks. I love banana! Especially banana milkshakes~ I'll try out your recipe too. your Señorita Bananas look like what we in Hawaii call "Apple Bananas". They are small, and very sweet! My favorite type of banana. You recipe looks amazing! I had no idea that there were so many varieties of bananas (I knew about plantains) - I wonder how many varieties are offered in stores here in the US? Now I know why there is such a difference in sizes. We love bananas! My whole family eats them daily! Glad to know it helps with immunity! We love bananas - especially in smoothies! And that recipe looks delicious (and ridiculously easy, too)...I'm going to have to try it! I like fried plantains so I know that I will definitely like this recipe. Melting the sugar on them will be so good. Thank you for sharing it on our Four Seasons Blog Hop. See you next week. This is such a helpful post. I didn't know that dark patches are associated with anti-cancer properties. Now, I'll use ripe bananas more often :) I love using ripe bananas to make 3-Ingredient oatmeal cookies.